Wheelchair accessible areas are available on both sides of the stadium. Accommodations for wheelchairs are in sections 104, 106, 202, 204, 205 and 207. For more information, call the UMHB Ticket Office at (254) 295-4455. Alcohol is prohibited on the UMHB campus. The UMHB Campus Store is open on game days from 9 am – Kick-Off in the Bawcom Student Union Building. In addition, the campus store will open the Spirit Shoppe in Crusader Stadium on game days. The Spirit Shoppe will be open an hour and a half before each game and remain open throughout the entire game. Take the Loop 121 exit and head North. Turn right onto Martin Luther King Jr. Avenue and head East to UMHB. Turn left onto University Drive to access parking lots with required permits. Continue East on MLK Jr. Ave to access open parking lots across campus. Option 1: Take the Loop 121 exit by the Bell County Expo Center and head West. Loop 121 will pass under Highway 190 and you will continue North on 121. Turn right onto Martin Luther King Jr. Avenue and head East to UMHB. Turn left onto University Drive to access parking lots with required permits. Continue East on MLK Jr. Ave to access open parking lots across campus. Option 2: Take the 6th Street exit and head West to Main Street. Turn right onto Main St and head North to Campus. Turn left onto MLK Jr. Ave. Head West to access open parking lots across campus. Continue on MLK Jr. Ave to University Drive. Take a right onto University Drive to access parking lots with required permits. Take the 6th Street exit and head West to Main Street. Turn right onto Main Street and head North to Campus. Turn left onto MLK Jr. Ave. Head West to access open parking lots across campus. Continue on MLK Jr. Ave to University Drive. Take a right onto University Drive to access parking lots with required permits. The University of Mary Hardin-Baylor Campus has a large number of parking lots that are within walking distance to Crusader Stadium. Please refer to the Game Day Parking Map for options. Parking spaces on the University Drive side of the Frank and Sue Mayborn Campus Center have been expanded to provide easy access for disabled visitors. Two tiers of accessible parking will be reserved for guests on the ticket booth side of the center. To enter the area, each vehicle must have official disabled parking plates or a placard hanging from the rearview mirror of the car. Placards may be obtained at the Bell County Tax Assessor-Collector’s office (550 E. 2nd Avenue, Belton 76513; phone (254) 933-5321 or go to bellcountytx.com). To keep postgame traffic flowing smoothly, fans will be directed to exit the campus via Crusader Way or Martin Luther King Jr Avenue. Fans will be directed toward Martin Luther King Jr Avenue where a RIGHT turn will lead to Loop 121. A LEFT turn will take fans toward College Street and the front of campus. Fans will be directed north on University toward Crusader Way. Then fans can turn LEFT on Crusader Way toward Loop 121 or RIGHT toward College Street. Elevators are reserved for use by credentialed personnel, disabled ticket holders and a companion. In case of an emergency regarding injury, medical emergency, lost child, etc. please make your way to the First Aid booth. Medical Staff and Game Day personnel will be there to assist you. For immediate response, please contact 911 or campus police at (254) 295-5555. First aid is available for fans at Crusader Stadium on the home-side concourse. Contact event staff if you have an emergency. UMHB football player parents' tickets are available at the ticket windows of the Mayborn Campus Center adjacent to Crusader Stadium. For visiting teams, the pass list will be located at Gate 3. Lost and found is located at the Info Station on the home-side concourse. Following games, items will be taken to the UMHB Police Department. To claim items, please contact the police department at (254) 295-5555. Please be aware of the following items that are not allowed within the gates of Crusader Stadium. All bags are subject to search. Download a printable version of the Crusader Stadium seating chart. Service animals are permitted at Crusader Stadium. No other pets are allowed. 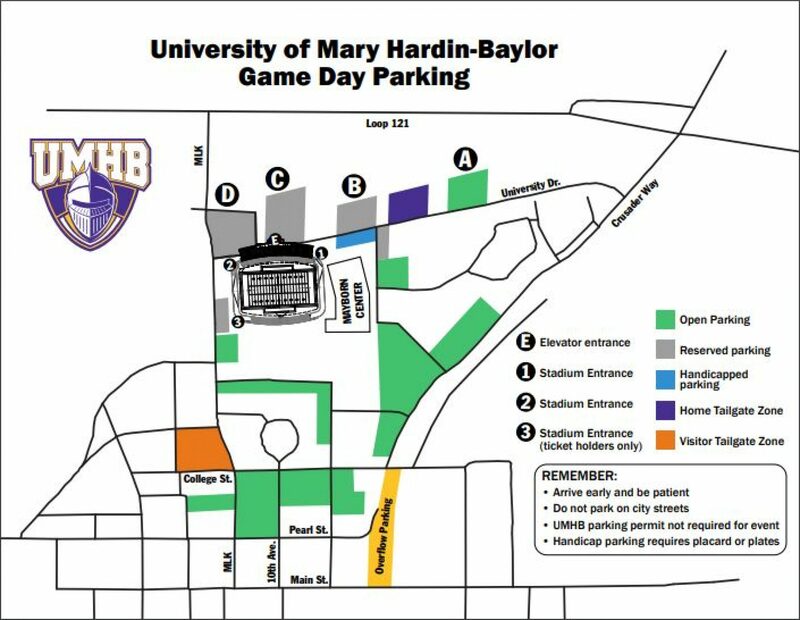 Tailgating is allowed in the unpaved area between Lots B and C. Alcohol is prohibited on the UMHB campus. Visiting team fans wishing to tailgate are encouraged to reach out to John Ellison (254) 295-4004 to get information on where they can tailgate. Individual game and season tickets are available for UMHB football games based on availability. For more information or to purchase tickets, please contact the UMHB Ticket Office at (254) 295-4455, by email at crutickets@umhb.edu, or visit the Events and Tickets page. The UMHB Ticket Office will be open 10 am - 6 pm, Tuesday through Friday during the week of a home game. The UMHB Ticket Office is also open two hours prior to kick-off on game days. Umbrellas inside Crusader Stadium should not obstruct the view of other spectators. Please be courteous to those around you. Will Call will be available at all Ticket Windows around Crusader Stadium. The pass list for parents of the Visiting Team is located at Gate 3. In case of severe weather, you will be directed to the proper locations around campus. Please keep an eye on the Video Board and listen for instructions from our PA Announcer. Crusader Stadium is a wheelchair friendly facility, with ADA compliant ramps accessing the concourse. Wheelchair viewing areas are also present on the concourse level. Crusader Stadium does not provide wheelchairs.